The wellbeing of our customers products is our main concern. It’s our responsibility to collect them. To store them. To deliver them when agreed, in the right configuration and to the right destination. But furniture is not just our business. It’s our passion. We care for them. Make sure no harm comes to them. That they arrive at their destination without any scratches. More than 99,96 % of all packages we deliver are without damages. It’s no coincidence. It’s because we love your furniture. We stay on course, keep focused and keep our promises. We love furniture and we love logistics. And we love to make our customers smile. We use our knowledge, expertise and creativity to overcome challenges and develop new innovative solutions. Clockwork™ is our flexible platform that you can use to create tailor-made furniture logistics solutions suited for your needs and business. Vepsäläinen Oy is one of the premium furniture and decoration retailers in Finland. 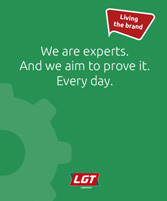 LGT Logistics is the leading furniture logistics specialist in the Nordics. Tailor made concepts for furniture manufacturers, importers, wholesalers and retailers, combined with high quality transports.